Tyanne got me a new vice! I'll be installing it on Thursday night. woo-hoo! This replaces my 10 year old Pony vice from Sears. I broke it bending the steel to make the mower hitch. Hopefully this one will outlast the workbench it's mounted to. 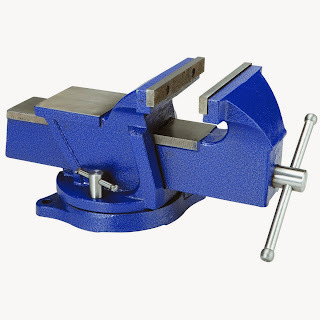 Tip: When you mount a vice, put it directly over the leg of your workbench. It makes a huge difference in the amount of deliverable force when you have to beat something. When you mount the vice in the middle of a bench, the whole bench flexes to absorb impacts. When it is right over the leg you transmit the force directly into the concrete below. You can really feel the difference this makes. My Isabella got me a new measuring tape for my toolbox too. I got to use it this weekend. That's a subject for my next post.